Future Darwin Award Winners: Automotive Edition (Funny Photos / Photo Gallery) : AwfulGames -- Awesome Online Games, Awful Humor and Really Fun Stuff. Despite the Name, No Awful Games! Admit it. You've seen them. People who simply shouldn't be allowed to breed. You catch them doing something so absurdly dangerous or mind-numbingly stupid that you think it's just a matter of time before Darwin wins. Well, thanks to some quick-thinking photographers, we've gotten a few of them on camera. Hope you enjoy! You see a pile of rocks. 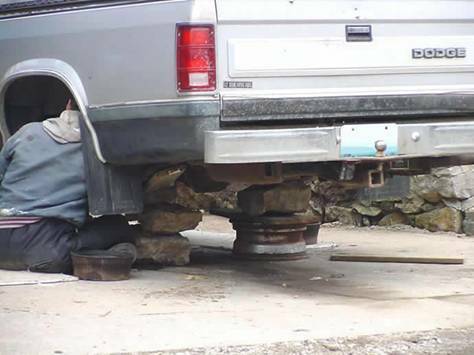 I see free jackstands!